Sentry makes the best dog toothpaste. It won't foam and it's safe to consume so no rinsing is needed. There are 2 different flavors (poultry and peanut) so you can give your dog some variety. Read more about Sentry dog toothpaste below. Can I Just Give My Dog Dental Chews? Let’s talk about teeth brushing! When it comes to teeth, dogs are very similar to humans. It’s true that they are not as likely to develop cavities as we are, but they can easily experience tartar and plaque buildup as well as suffer from periodontal diseases like gingivitis. Neglecting your dog’s teeth leads to poor oral health and dental problems that can result in other serious health issues like infections, organ failure, and heart, liver, and kidney disease. Did you know that by three years of age, 85% of all pet suffer from some sort of periodontal disease? Periodontal disease (also called gum disease) is caused by bacteria. After a dog eats, bacteria in her mouth starts forming plaque, a sticky deposit in which that bacteria proliferates. The immune system recognizes the plaque as a foreign invader and sends white blood cells to remedy the situation. Unfortunately, this causes tooth decay and loss. Even worse, bacteria that makes its way under the gums can travel through the bloodstream to the kidneys, liver, and heart causing major health problems. Luckily, oral health problems are preventable and it’s easy! The routine is basically the same for dogs as it is for humans: regular checkups, periodic professional cleanings, and daily oral care (using the best toothpaste for dogs). 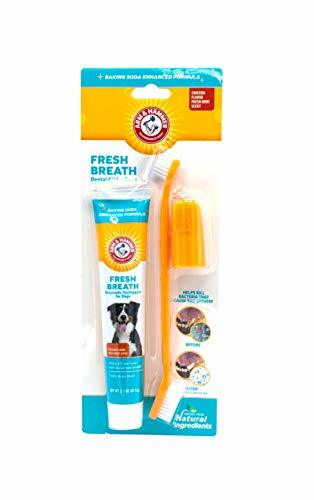 This will give your dog the greatest chance of having a healthy mouth. So what does this mean exactly? Attend regular checkups with your veterinarian as he/she recommends. This is a preventative measure so the doctor can assess your dog’s overall health, including oral health. If something is wrong, he/she can catch it early. Get your dog’s teeth professionally cleaned at least once per year. Your dog will be put under anesthetic so that the veterinarian can thoroughly assess the overall oral health as well as clean wholly. This prevents plaque and tartar buildup as well as periodontal disease. Perform oral care on your dog as often as possible, preferably every day. At a minimum, visually inspect her mouth to check for plaque and tartar buildup, inflamed gums, loose/broken teeth, or other problems. Preferably, brush your dog’s teeth as thoroughly as possible using a soft-bristled toothbrush that is specific to dogs as well as toothpaste specially formulated for pets. Never use human toothpaste as it can be harmful to your dog. The short answer is no. There are many benefits to things like chews, dental chews, and chew toys. They satisfy your dog’s natural urge to chew, protecting your shoes and furniture as well as entertaining and stimulating your dog. It is much easier to convince a dog to chew on something tasty by herself than it is to convince her to let your scrub her mouth. They can help break up the buildup of tartar and plaque. However, they are not good enough to be the only tool for good oral health. Eating apples or carrots can help clean a human’s teeth, but they are not a substitute for brushing and the same can be said for dog chews. They are beneficial, but they are not a substitute for brushing with the best dog toothpaste. I hope by now you are convinced that it is necessary to brush your dog’s teeth daily. The hardest part is starting. Once it’s part of your routine, you won’t even have to think about it. In the next section, I’ll give you some tips and tricks about how to brush your dog’s teeth. But right now, I want to talk about toothpaste. The toothpaste we use can be harmful to your dog if swallowed, so it’s better to use a toothpaste that is specialized to dogs. It will be specific to your dog’s oral health needs. Oftentimes, they are flavored something like poultry or peanut enticing your dog and making the whole experience more enjoyable. I’ve chosen five of my favorite dog toothpastes and compiled some information about them for you to use to make the best decision for your dog. They are all good choices, so I would recommend either choosing your dog’s favorite flavor or switching it up periodically. Some dogs like the variety. I personally switch between poultry and peanut flavor every so often to keep my dog interested. This is the toothpaste I use for my dog and she loves it. The poultry flavoring makes it just like a treat. It also comes in peanut flavor. It is formulated specifically for pets with patented enzymes. It doesn’t foam and doesn’t require rinsing, making it easy to use. It helps fight bad breath, control plaque, and polish your dog’s teeth. This is a dual-enzyme system toothpaste formulated for dogs and cats. It provides natural antibacterial action and inhibits plaque formation. Bad breath beware, as mouth odors will be eliminated. There are no foaming agents and it is safe for pets to swallow. This is vanilla-mint flavored, but it also comes in beef, seafood, poultry, and malt. There’s bound to be one your dog will love. 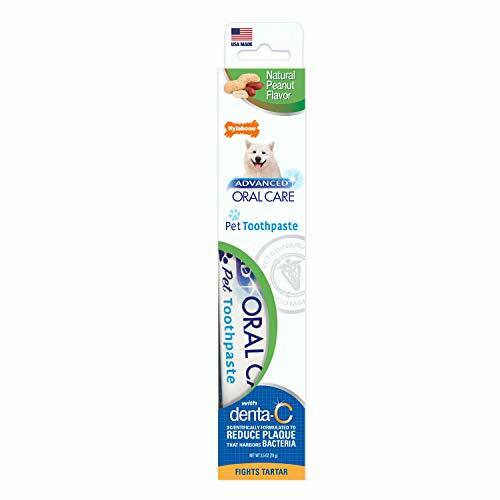 This is a delicious all-natural, vanilla-flavored toothpaste that will help keep your dog’s oral hygiene in check. It does contain sorbitol, a sweetener that makes some people nervous. However, sorbitol is not toxic to dogs like xylitol is so this toothpaste is completely safe. It polishes teeth, keeps breath fresh, and has antiseptic and antifungal agents for great oral health. This toothpaste is a great tool in reducing the risks of developing oral diseases. It comes in a delicious peanut flavor your dog will love. It is made with Denta-C, which is scientifically proven to reduce that nasty plaque that harbors harmful bacteria. Daily use will reduce plaque and tartar buildup and maintain healthy teeth and gums. The Arm & Hammer name has been trusted for gentle, yet effective cleaning for over 100 years. This toothpaste cleans and deodorizes with the power of baking soda. Daily use will help you safely clean and maintain healthy teeth in your dog. Let’s first talk about introduction and training where I will offer instructions and suggestions on how to introduce your dog to the act of teeth brushing and train her to remain calm and even enjoy the activity. Then we will move on to the actual brushing. The best tip I can give you is to start early and do it often. Puppies need their teeth brushed too and the earlier you start, the easier it will be in the future. If teeth brushing is part of your daily routine, your puppy will know no different and accept it as something that happens normally. The second best tip I can give you is to start slow and make sure that the experience is always positive. If you have to hold your dog down and forcibly brush their teeth, then you are damaging your relationship with your dog and probably not doing a very thorough brushing job anyway. Take the time to get your dog comfortable with it. Place a small amount of the dog toothpaste on your finger and let your dog lick it off. Hopefully, your dog will enjoy the taste (most dogs do). Offer your dog lots of praise. She’ll be tasting something delicious AND being lauded for it. It doesn’t get much better than that. Do this several times a day, making sure your dog loves it. Afterwards, play fetch or tug or whatever game your dog likes most. Step Two: What’s in My Mouth? Help your dog get used to having her teeth and gums touched. You can do this by placing a small amount of toothpaste on one of her teeth or gently rubbing your finger along her teeth and gums. Pay attention to how she responds and make sure she is comfortable. Don’t overwhelm her by moving quickly to doing too much at once. A little bit at a time will do, several times a day as she is comfortable. And remember to offer her lots of praise so she knows this is fun activity. As she gets more comfortable, do a little more by adding a little pressure (remaining gentle) and lifting her lips. Again, play her favorite game afterward. This lets her know that good things happen when she lets you touch her mouth. Moisten the toothbrush with water and add a small amount of toothpaste. Offer it to your dog. Let her sniff it and lick it to her heart’s content so she gets used to the different texture. She probably hasn’t licked something quite like a toothbrush before. Do this several times a day followed by her favorite activity so she gets comfortable. Now that your dog loves the toothpaste, is comfortable with fingers in her mouth, and is used to the texture of the toothbrush, it’s time to start brushing. Be gentle. Go slowly. Praise your dog. Stop if your dog is uncomfortable. Hold the brush at a 45-degree angle against the teeth and brush in circular motions. If the toothbrush is too much for your dog, then try something less harsh. There are finger toothbrushes with soft plastic bristles that work great. If that is still too much, try a piece of gauze wrapped around your finger or a cotton swab. Remember, go slowly and offer a lot of praise. The more comfortable your dog is, the easier it will be. Step Five: That Was Fun! After you are finished brushing your dog’s teeth, offer her a lot of praise and proceed to a fun activity of fetch, tug, belly rubs, or whatever makes that tail wag. Ok let’s wrap this up with some general tips. Remember, brushing your dog’s teeth daily is essential to her oral and overall health. Make it part of your routine and it will be a breeze. I hope you found this article helpful and fun. At ReadySetDogs, we are committed to helping you take the best care of your dog possible. Feel free to contact us if you have any questions.